The term trullo comes from the Greek trullos, meaning dome, while the term for these dry stone constructions in the Upper Salento and throughout the Murgia, was simply “casedda”, literally small house. And that is what it actually is – a modest but comfortable house built by peasants who cleverly used the most abundant raw material to be found in their surroundings, i.e. limestone.Today, trulli are a UNESCO world heritage site. Some trace the origin of trulli back as far as 1500 BC, when the Classical Greek term tholos was the name given to a dome on a tomb known as the Treasury of Atreus. Others, however, trace it back to the Byzantine Greek term torullos, the domed hall in the imperial palace of Constantinople. Finally, there is the Latin word turris with the related words turulla, trulla, trullum indicating a small tower. 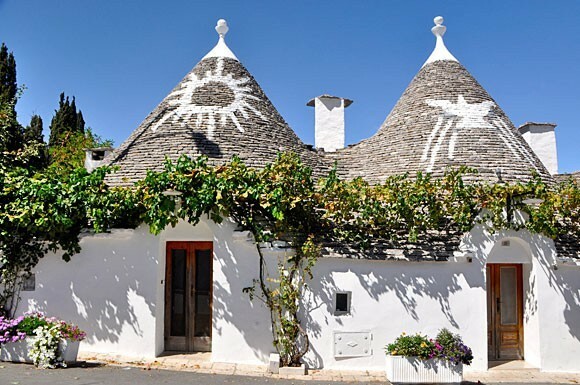 Trulli are the first example of insulated buildings. Cool in the summer and warm in winter. 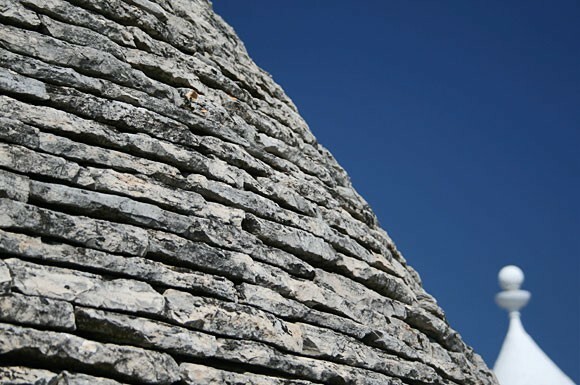 Both the walls and conical roof are built using dry stone masonry, with no mortar except for some limestone fragments which form an insulating cavity that absorbs both heat and cold and thus keeps the temperature constant. 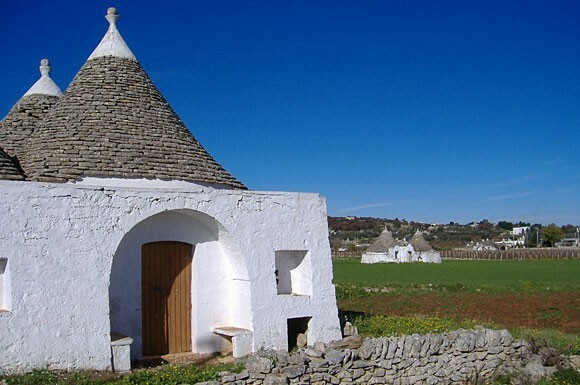 The cone roof of a trullo is built without a frame, using just the limestone slabs (known as chiancarelle) cantilevered one on top of another in ever tighter circles, topped with a small aperture. The master trullo builders made their constructions into self-sufficient dwellings for humans and for animals; a single room of thirty square meters with its own fireplace, well, hayloft, harvest store, and workshops for processing the harvest. Some of the wooden beams that can still be seen today in the trulli had no structural function, but were used for hanging up food and other supplies, thus keeping them off the ground. The passive nature of a trullo structure enables it to absorb even the strongest earthquakes. A report of 1897 speaks of a cyclone that swept everything away, leaving only the trulli intact. 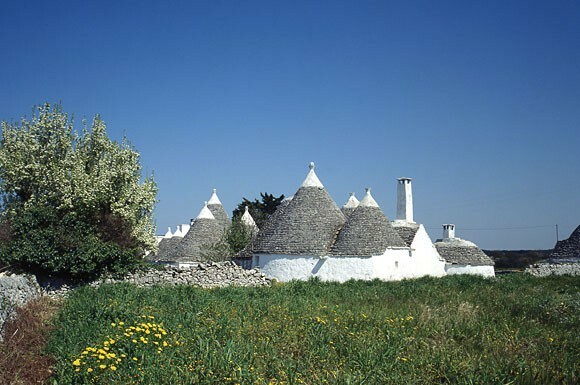 It is also thought that the Trulli were used to evade payment of property taxes. There are various theories on this. One of them claims that smoke signals from the Trulli were used to warn of the arrival of any tax-collectors; in that case, the roofs would be removed, and would be rebuilt once the danger had passed. Popular legend has it that as the landlord approached, demanding payment of the tithe for living on the plot, all the peasant had to do was pull one stone to bring down the whole building, making it look like a mere pile of stones. The most significant area for Trulli is the Itria Valley. 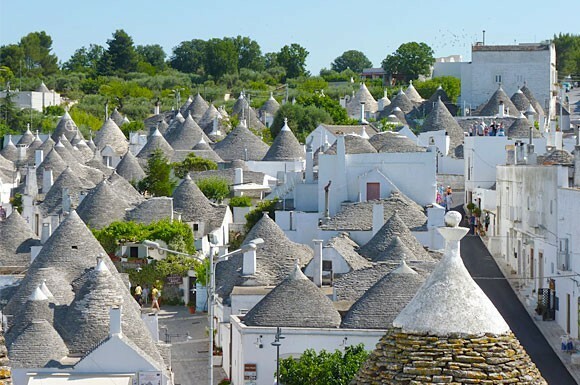 Here the town of Alberobello, having a whole quarter made up of trulli, is to all intents and purposes the “Capital of the Trulli”. Other areas of particular significance can be found in the countryside around the nearby towns of Locorotondo, Martina Franca, Cisternino, Ostuni, Ceglie Messapica and Fasano. There are similar constructions in the northern part of the Murgia promontory, around Monopoli and Polignano a Mare, where they are closer to the sea and used for other purposes, and so have rather different architectural details. Even in the northern part of Bari province, in the North-Western Murgia, many trullo-type buildings can be found. These were mainly used by shepherds as temporary shelters. Some are very imaginatively designed, while others are much simpler. 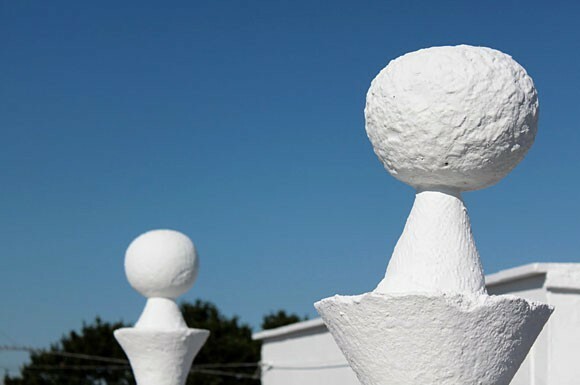 Other types of trulli, also called “pajare” are widespread in the areas inland from the Ionian coast around Lizzano, Torricella, and Sava, as well as throughout the Salento peninsula.